Notice this inquisitive fisher’s slim body, pointed face, rich brown fur, and rounded teddybear-like ears. This question comes up sooner or later in conversations about wildlife in Westborough. We’ve all heard of fishers or “fisher cats,” but few of us have seen this mysterious native animal. What sort of animal is it? A fisher (Martes pennanti) is not a cat of any kind, and it doesn’t fish. It’s a member of the weasel family (Mustelidae). Its relatives include weasels, minks, river otters, sea otters, and ferrets – animals that seem more familiar to us even if we haven’t seen them in the wild. It’s no surprise that fishers are an unusual sight. They live and hunt in forests and avoid open areas. Like many animals, they’re most active at night, dawn, and dusk, when Westborough residents are not usually tromping through the woods. Why are they so unfamiliar to us? One reason may be that fishers have been gone from Massachusetts since the 1830s – until relatively recently, that is. They disappeared from the state as the land was cleared for farming in the early 1800s. Logging and trapping may also have contributed to their decline. They retreated to forested areas of northern New England and Canada. But starting in the 1960s, fishers returned as forests grew back. They’re now found throughout our state, except on Cape Cod and the islands. Like wild turkeys and beavers, fishers are among the comeback kids of Massachusetts wildlife. You’re more likely to see a fisher today than ever before. As they’ve become more common, they’ve begun to venture closer to our roads, trails, houses, and yards. What does a fisher look like? They are long, low, slim, and furry. Their fur-covered tail makes up about one-third of their length. They have a somewhat pointed face and rounded, teddybear-like ears (as you can see in our photo). Males are considerably larger than females. Males are about 3-feet long (including tail) and weigh eight to 16 pounds, but females are 2 to 2-1/2 feet long and weigh only four to six pounds. Fishers have short legs and relatively large feet. Their fur is a rich dark brown. Fishers are not cats, but they do have some features that might remind you of cats. They’re similar in size. If you glimpse the long, low silhouette of a fisher hurrying through the undergrowth or crossing a road, you might wonder whether you’ve seen a fisher or a cat. Fishers have retractable claws like cats and can climb trees, so they can pursue prey or seek safety up a tree. Females typically live with their young high in a tree-hole den for about 5 weeks, before moving their young to an underground den. You’re most likely to see a fisher in a forest, especially a large, unbroken tract of forest with logs and fallen debris on the ground. Fishers like areas with conifers or both conifers and hardwoods. Unlike the deer and red foxes we sometimes spot, fishers are not creatures of woodland edges. You might come upon a fisher near an old stone wall, hollow log, brush pile, stump, or tree hole, which serve as resting places for them. Fishers are more apt to be out in the daytime during the winter than in summer, so watch for them in the upcoming months. They don’t hibernate. In winter they shelter in underground dens or tunnels under deep snow. If you like to look at animal tracks in mud or snow, check for fisher tracks. Their footprints have five toes (unlike the tracks of cats, dogs, foxes, coyotes, and bobcats, which have four toes). Their prints are relatively large at 2-to-3 inches across. Their large feet help them walk on top of snow. The pattern of their tracks may show two feet together, side by side, made by the fisher’s bounding run as its front feet and back feet land in the same place. 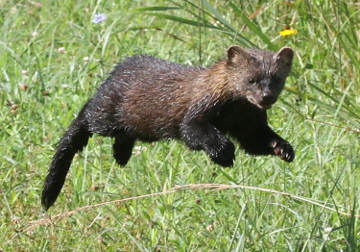 A fisher in mid-air during a bounding run. The fisher’s back feet are unusual because they can swivel around to face almost backwards. This position is useful in climbing trees, and it also helps fishers go head-first down a tree. What do these predators eat? In our area, squirrels are a major part of their diet. Fishers do most of their hunting on the ground, but they aren’t limited to the ground. Thanks to their agility and slim shape, they can follow prey up trees and into tree holes or down holes in the ground. They usually avoid going into water. In addition, they dine on mice, shrews, chipmunks, rabbits, birds, raccoons, muskrats, insects, eggs, and carrion from deer carcasses. They also eat berries, fruit, and nuts, such as raspberries, cherries, apples, and beechnuts. Fishers are unusual in being able to take porcupines – another animal that we rarely see even though it lives in our area. (Did you know that porcupines climb trees? They’re often found in stands of hemlocks.) Fishers dart in and out, biting a porcupine’s face, and eventually flip it over and attack its underside, which is not covered with quills. Between 1959 and 1974, fishers from Maine were successfully reintroduced in Vermont to control the greatly expanded porcupine population, which was damaging the state’s timber resources by eating tree bark. We sometimes hear that fishers are a danger to pet cats. In our area, it’s much more likely that a coyote is the culprit when a cat disappears. Like many other members of the weasel family, fishers have what to us is a surprising characteristic: they mate in the spring shortly after giving birth, but the fertilized eggs then go dormant and remain that way for 10-11 months before implanting in the mother’s uterus. After this delayed implantation, they develop normally. Fishers typically give birth to 3 or 4 young in March or April. The mother nurses them for about 10 weeks, and they stay with her throughout the summer. By six months of age, in late summer or early fall, the young are the size of females and fully independent. They go on to live the solitary lives that are typical of fishers. Fishers have been trapped for their fur since colonial times. Their pelts were often used to make neck pieces and scarfs. Today, trapping in most states is tightly controlled. In Massachusetts, fishers can be trapped but not shot. The Massachusetts trapping season for fishers is limited to three weeks in November. If fishers don’t fish, where did their name come from? In colonial time, fishers reminded early settlers and trappers of the polecats found in Europe, and the name “fisher” sounds somewhat like the French name for those animals. Several Native American languages have their own very different names for the fisher. “Fisher cats” is also the present-day name for the minor league baseball team based in Manchester, New Hampshire. 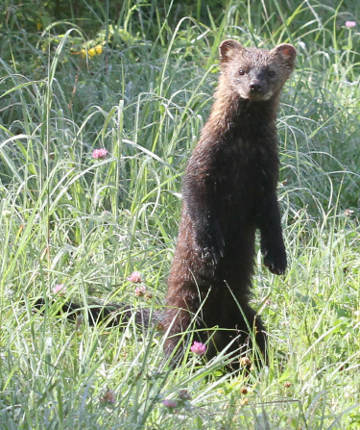 If you happen to see a fisher, enjoy the sighting (and consider reporting it on the “Sightings” page on the Westborough Community Land Trust web site). And have fun talking about the fisher and its recent comeback in Massachusetts when the conversation turns to animals!